The design of this women’s vintage wallet is lovely and stylish. It is 7.2 inches long, 3.8 inches high and 1.2 inch wide. The wallet is made of faux leather. It has two section; card section and zippered section. The card section contains 11 credit card slot, 1 clear slot for an ID and 3 slots for cash or checks. On the other hand the zippered section has two pockets which has enough room for cellphones and checkbooks but not suitable for larger like galaxy note due to the inside dimension is less than 7 inches long and 3.8 inches wide. It is perfect for holding everything. So you can go walking without bringing a big wallet. Only drawback the slots are very tight and awful smell inside the wallet. Awful smell inside the wallet. 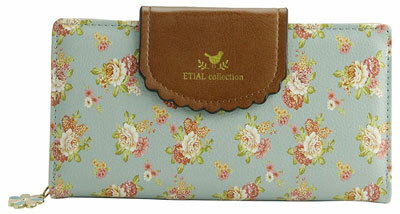 Overall, this women’s vintage wallet can be a wonderful gift for girls and ladies.